Why we love it:It's the mascara that's beyond belief! This jet-black mascara lengthens, curls, volumizes, lifts & separates lashes for a spectacular "out-to-here" look.What else you need to know:The exclusive brush is specially designed to maximize the performance of the long-wearing, glossy formula-revealing lashes you never knew you had! Staggered bristles grab close to the root, boosting length & volume beyond belief. The precision bristles on the custom-domed tip lift, define & curl even your tiniest lashes. The end result...luxurious, silky lashes that won't smudge, clump or dry out. 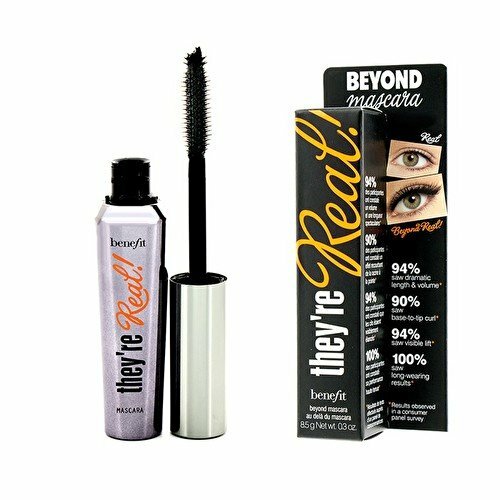 Learn more about they're real! and see before & after photos. Benefit Cosmetics They're Real! Mascara "black"
If you have any questions about this product by Benefit Cosmetics, contact us by completing and submitting the form below. If you are looking for a specif part number, please include it with your message.